Thanks to a tweet from Nom Foods I discovered Tesco's latest promotion, The Lifestyle Food Fair. It is running in Tesco Extra Stores from 2nd June – 31st August. I am fortunate to have a store on my doorstep so as soon as I returned from holiday, off I went to fill my trolley. This new promotion covers a range of products for dietary needs and lifestyle choices - free from, organic free from, vegan friendly and future food trends. I am rather excited about the whole idea. I want it to be a success so Tesco can see that they have customers who want and need these foods. The standard free from section is now entirely gluten free (give or take a handful of products). I tend to only visit Tesco for dairy free chocolate and Alpro yoghurts. Vegetarians are well catered for at Tesco but the Vegan choices are virtually nonexistent at times. I now buy the bulk of my vegan and dairy/egg free food from a local organic store or Holland & Barrett. A couple of people have made comments on Twitter that free from should not fall under “Lifestyle” as it’s not a choice. I do not disagree but I really could not care less about how it’s being labelled. 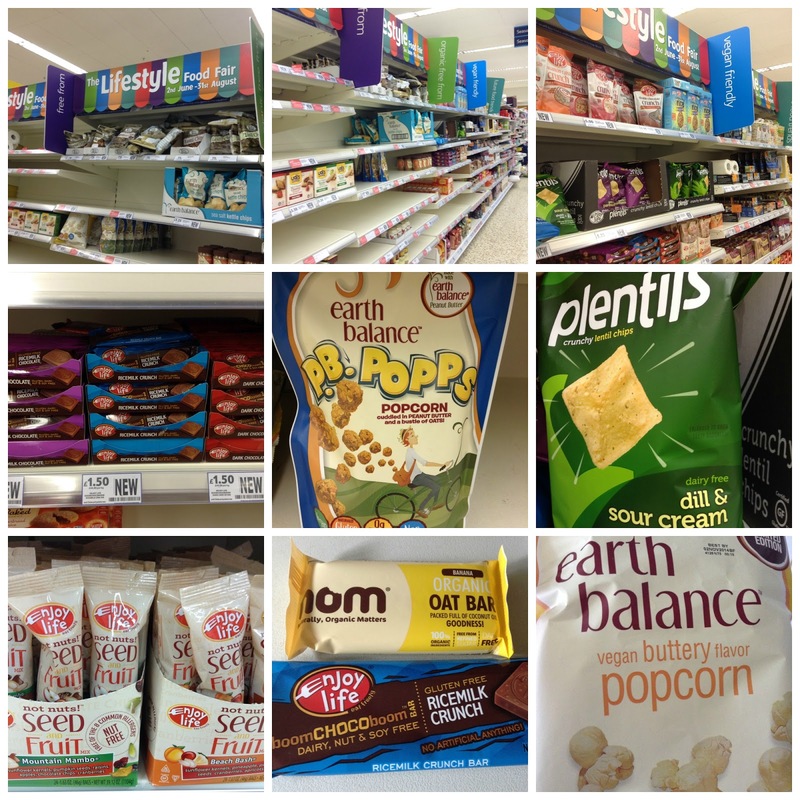 The simple fact for me is I stood in Tesco getting very excited about Vegan popcorn and crisps. At the end of the day people are making choices to cut out certain food from their diets without medical reasons and you can’t do anything to stop them. If this helps encourage more free from products into the supermarkets and I no longer have to drive 34 miles round trip for a Nom Bar, then I’m supporting it. I do not believe it detracts from the seriousness of allergy/intolerance; this is where improvements to education are needed. I want inclusion not exclusion. Sometimes I feel like people need to take a step back, stop moaning for five seconds and celebrate what is available and what the future may hold. Anyway, rant over. I’m super excited to see US brands Earth Balance and Enjoy Life. You can see from my pictures some shelves were bare and the labelling indicates more stock will be arriving. In my store, one of the shelving sections looked like it will be dedicated to new Udi’s products. I will say some products did not suit my personal budget. I do find £4-£5 for granola a bit cheeky but I guess it’s on a par with organic food stores. I had been boycotting Tesco over the nut labelling debacle but I’m going to have to admit I have been swayed back there. Sorry folks, I do think Tesco are rubbish at labelling but this new promotion is bloody brilliant and I’ll have to admit defeat, for the next 13 weeks at least. Looks good, I generally avoid Tesco as I find them overpriced! Considering they are supposed to be a budget supermarket I would go there last after Asda, Aldi, Lidl or Sainsburys!! I may have to pop in now after seeing this... I love finding new snacks regardless of whether they are 'free from' or not, I look at each item individually and decide if I want it or not. Thanks for the info and post! Thanks for the comment Annie. I spread my shopping around but it's good for larger supermarkets to get on board to make free from feel more "main stream"
I agree with Annie, not everyone can shop around for the products they need so i'm glad to hear that one of the big ones is making it easier for people. Nice to see some different brands available too!